Stink bugs have few natural predators - Stink bugs are not native to North America and have virtually no insects or animals that will eat them. Stink bugs attract other stink bugs - When stink bugs congregate they emit a hormone which attracts other stink bugs to their location. Stink bugs can bite people - Believe it or not, many people (including some researchers) say this is not true. But there have been hundreds of new cases of people being bitten by these bugs. 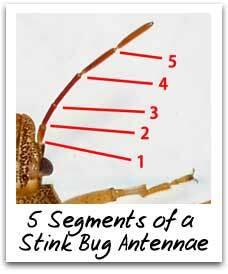 A stink bug's antennae will be able to bend at 5 different joints throughout the antenna. If you look closely at a stink bug, you may be able to count the segments on the antenna. Since stink bugs are fairly small insects, it can be very difficult to see all 5 segments. With the naked eye you will probably only be able to see 3 or 4 segments. So in order to see all five you will need to use a magnifying glass or a powerful camera. Stink bugs are not also called shield bugs for nothing. Another thing all stink bugs have in common is the same shield shape on their back. On all stink bugs, the shield will start at their shoulders and end at a point near the back of the bug. The pictures below help illustrate this. (Note: the red shield in the pictures should help show you what to look for. All stink bugs have the same triangle shape on their back. You should look for an upside down triangle starting at the shoulder and ending at a point near the back of the bug. The pictures below help illustrate this. 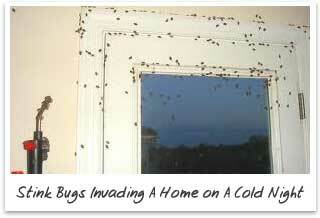 All stink bugs will be fairly small and will usually be ½ an inch in width or less. They will also always have six legs and two antennae (unless one or more have fallen off). Of course, there is no need to see a picture depicting this as there are already several pictures of stink bugs on this page. There are many ways that you can get rid of stink bugs. Unfortunately, most of these ways are the wrong ways. Below you will learn the various right and wrong ways to get rid of stink bugs. This is the absolute worst way to get rid of stink bugs around your home and property. There are two reasons why you don't want to do this. The first reason you shouldn't smash a stink bug is because stink bugs smell horrible! Whenever they feel threatened they release a pungent odor (smells like rotten eggs and trash). The last thing you want is this odor on your hand/shoe or in your home. The second reason why you shouldn't get rid of stink bugs by smashing them is because their body releases a distress hormone in the air that attracts other stink bugs. So when you smash one stink bug, you're actually going to end up with more coming to it's aid. 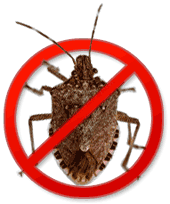 While exterminators are a good choice for most insects, stink bugs are not one of them. Most of the time exterminators will spray the inside and outside of your home with a poison that insects will not cross. But, while most bugs will detect the poison and will not cross it, stink bugs will not do this. Stink bugs will start trying to get through the poison on day one, and since the poison can take up to 12-24 hours to kill those stink bugs will end up in your home. Eventually when the poison becomes less effective (usually from the first batch of bugs absorbing most of the poison) other stink bugs will be able to cross and get into your home without dieing. This is another bad idea, because the stink bugs will take months to leave. By that time they will have destroyed most of your outdoor plants and will have made both your house and your property smell awful. If you're thinking that you've only seen a handful of stink bugs around your property and that it can't get that bad, think again. Once it gets cold outside all the stink bugs around will be looking for a place to go that is warm and they will see your house as a shelter. Look at the sheer number of stink bugs invading the person's home above on a cold night and think of if you could and what you would do to handle that situation. By far, the best way to get rid of stink bugs is by using a combination of natural remedies and preventative techniques. These techniques will actually make your home and property invisible to stink bugs so you don't have to deal with stink bugs in the first place for future seasons. Better than Smashing Stink Bugs - How else would you kill a stink bug besides smashing it if you caught one inside your home? You can't vacuum them up using traditional vacuum cleaners because the rotation within the bag will smash them. Would you flush it down the toilet and use one gallon of water per stink bug? There are much better (and more ecological) ways to kill stink bugs. One such natural method is the water bucket trick. It kills stink bugs within 20 minutes and can kill hundreds at a time. What you do is you get a bucket of water and fill it 1/3 the way up with water and then add a tablespoon of dish soap to it. Then whenever you come across as stink bug you brush, flick, or force it into the bucket of water. When the stink bugs hit the soap suds they will not be able to swim or fly and will quickly sink to the bottom and drown. Better than Exterminators - When using natural techniques you will learn how to make your house invisible to stink bugs so they won't even find your home in the first place. It's pretty easy and doesn't involve using any poison or foul smelling repellents whatsoever. One trick is turning off all outside lights and shutting the blinds in your home to block any indoor lights from being seen outside. Like most insects, stink bugs are attracted to light and keeping your property and home dark from outside will prevent stink bugs from finding your property at night. Want to learn all the tips, tricks, and methods to easily get rid of stink bugs from your home and property? We have included everything you need to know to eliminate your stink bug problems as quick as possible in an easy to follow guide. You can download this guide today and start seeing results in just a few days. How to Get Rid of Stink Bugs Learn everything you need to know to get rid of stink bugs. Brown Marmorated Stink Bug How to tell if you've got brown marmorated stink bugs. Stink Bug Control Learn how to control the stink bug population on your property. Stink Bugs in Maryland Live in Maryland? 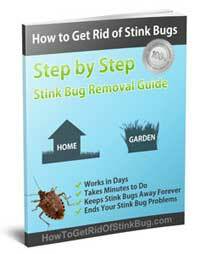 Learn how to stop your stink bugs. Stink Bugs in Virginia Virginia resident? Learn how to stop the Virginia stink bugs. Stink Bugs in Pittsburgh Can't get rid of stink bugs in Pittsburgh? Learn how. Stink Bugs in New Jersey Live in New Jersey? Learn how to get rid of the NJ stink bugs. Stink Bug Trap Learn how to build a stink bug trap to kill stink bugs.